Payton looks like a happy chap! Meet Payton! He's 62 pounds of German Shepherd/Siberian Huskie. Payton is 8 years old. He likes his walks and is good on the leash. He has a beautiful coat that will benefit from regular brushing. We don't know if Payton has lived with other dogs so he should meet everyone in your family, including dogs, to see how everyone gets along. Because of his age, Payton needs to go to a home with no children under 14. 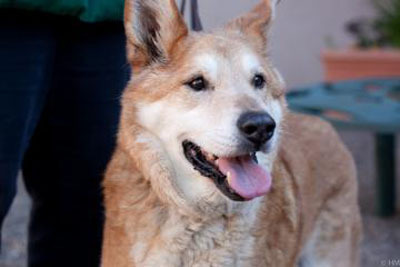 Payton is eligible for adoption through our Seniors for Seniors program where eligible adopters over the age of 60 can adopt him free of charge.